Bling Bling I have a diamond ring! A Cassiani collection exclusive these stylish silver chrome heart bottle stoppers are sure to appreciated by your guests. Each favor has an Bling encrusted silver round diamond ring design topper accented with a perfectly placed crystal and attached to a metal base and measures 4.5" long. Every time your guests sit down to enjoy their favorite vintage they will be reminded of your generous gift. Packaged in an elegant silver and white damask print gift box wrapped with a white satin ribbon and matching thank you tag. Hello, I wondered if the "personalized Bling A Diamond Ring comes in a box? 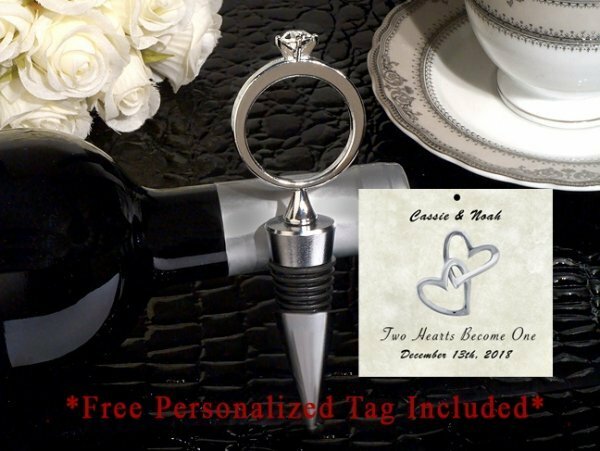 Yes, the Personalized Bling A Diamond Ring Silver Wine Stopper is packaged in an elegant silver and white damask print gift box wrapped with a white satin ribbon and matching thank you tag. is it possible to engrave the Bride & Grooms names around the upper silver part before the black stopper and the date of their wedding? I would be using this for a engagement party. 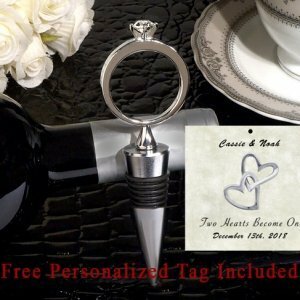 Unfortunately, we do not have engraving option for this Personalized Bling A Diamond Ring Silver Wine Stopper. You only have an option to have a personalized tag where you can enter the text that you want.